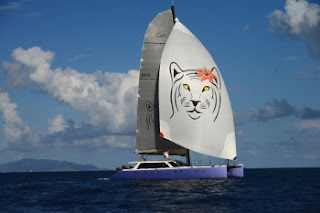 The charter catamaran Tiger Lily has just opened their calendar for Christmas 2015 and New Years. Tiger Lily (previously named Gazelle) is a 66-foot Gunboat performance catamaran with a crew of two. 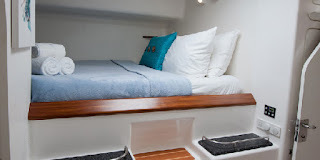 The yacht is fully air conditioned and accommodates up to 6 guests in 3 cabins, each with a Queen-sized berth and private ensuite head/shower. Tiger Lily has a 15-foot center console dinghy with 70HP motor, waterskis, tube, kneeboard, wakeboard, windsurfer, 2-person kayak, two standup paddleboards (SUPs), snorkel gear, fishing equipment, TV/DVD, wifi, etc. Their fishing gear is quite impressive. Their rods, reels, and tackle are nice but, and this is really cool, they have a custom carbon fiber fighting chair mounted off the radar dome which swings out over the sea. What an exhilarating place to hang out while sailing, too! Sadly, we have not been able to offer an 8-pax catamaran to our clients for a new years charter for months but now we have one... HURRAY! Why "almost inclusive"? Your onshore meal & partying on New Years Eve is at your expense, although you can return early and ring in the new year with champagne aboard the yacht. Also, as per standard procedure, the evening meal for the sleep-aboard is ashore at the client's expense. 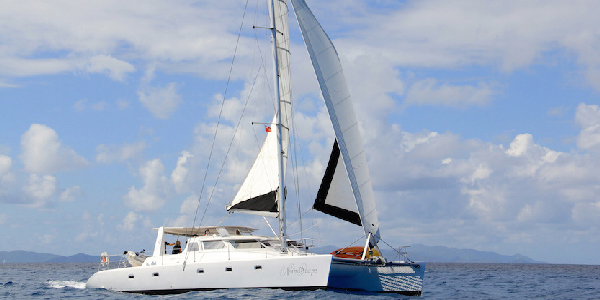 Windscape is a 52-foot, Voyage 520 catamaran with a very experienced, non-smoking, charter crew of two. We have known Kerry & Bazza for a long time (they were the owner-operators of the trimaran Promenade) and we have had many successful charters with them. 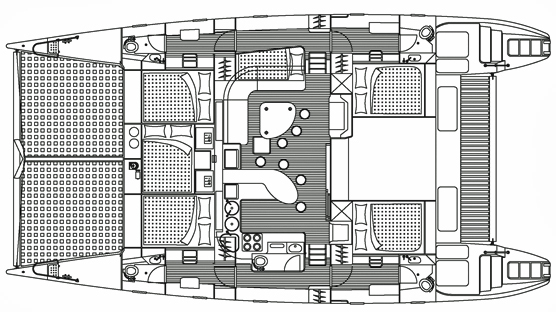 Windscape is fully air conditioned and accommodates up to 8 guests in 4 queen cabins (step-up berths), each with ensuite bathrooms with shower and electric toilets. Amenities include: 12-foot dinghy with 40HP motor, tube, kayak, standup paddleboard (SUP), snorkel gear, fishing equipment, floating mat, internet access, iPod dock, underwater lights, one 2-tank rendezvous dive. If you are certified divers and would like to do more diving, the crew will be happy to rent gear & tanks for you (at diver's expense) and be able to dive off the yacht. 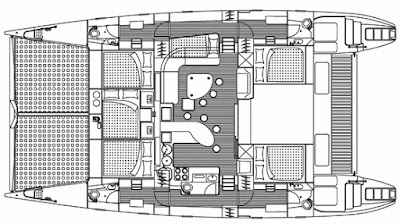 $29,900/wk for an 8-guest, holiday charter. It includes a sleep-aboard the night before the charter (so 8 nights). New Years Eve will be off the boat at your expense, although you may come back to the boat early and ring in the new year with champagne. December 26, 2015 (sleep-aboard) through January 3, 2016. 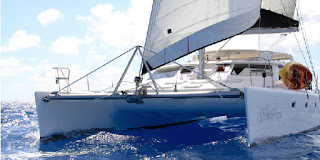 This is a crewed charter with a very experienced crew of 2. It is an all-inclusive charter (including meals & standard ship's bar) except for your evening on shore for New Year's Eve & sleep-aboard evening meal. Your schedule would be as follows: Board the yacht after 6 PM at West End, Tortola to settle in for your sleep-aboard. Dinner would be taken ashore at your expense on Tortola, Saturday 26 December 2015. Charter leaves dock mid-morning on the 27th (Sunday) and will go wherever you want and do whatever you like. New Years Eve (Thursday the 31st) will be ashore at your expense for dinner and partying (or come back to the boat early and ring in the new year on the yacht with the stars and champagne on board!). Departure date will be Sunday, 3rd January by 10 AM. Click on photos to enlarge in a new window. Once this New Years charter opportunity is made known to the public it will not last long. The charter catamaran Pisces has a new crew, Jonathan and Nia. 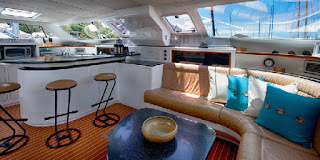 Pisces, a 47-foot Leopard catamaran, is fully air conditioned and accommodates up to 6 guests in three cabins, each with Queen berth and ensuite head/shower. 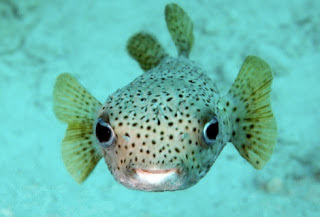 Jonathan & Nia are aboard Pisces now and have opened their calendar for summer charters! What's more is they are offering a summer, "get to know us" discount. 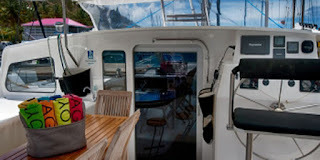 We just had another inquiry for an 8-person catamaran for New Years. I hate to say we don't have any yachts of that size that are still available for a New Years charter... there hasn't been for months. BOOK EARLY for the holidays. This post is now irrelevant as it was for holidays in 2015..